This chapter will explore understandings of culture, ethnicity, indigeneity, intergenerational trauma, and othering and how they relate to health outcomes, experiences with illness and death, accessing healthcare and palliative care, and patient/practitioner interactions predominantly in Canada. Discussions will define indigenous and ethnic minorities and examine the commonalities in health disparities experienced by both groups. Although commonalities will be discussed, they will be paired with the continual need to avoid “pan-Indigenous” or “pan-cultural” understandings that oversimplify the reality of diverse populations. Culture, spirituality, the desire to provide palliative care within the home and community, and subsequent barriers to doing so will be introduced. Though rumblings of culturally safe models of care continue to grow throughout the country, they are often overpowered by stories of mistreatment, discrimination, and colonial behaviors in the healthcare system. 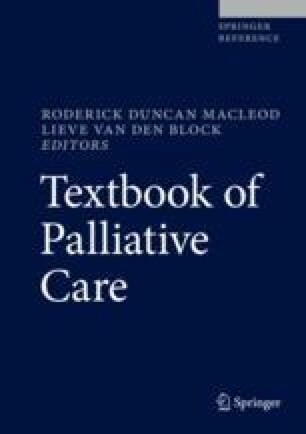 In an effort to overcome these barriers and provide the best possible end-of-life care to individuals, a brief overview of cultural safety and culturally safe models of palliative care will be introduced. Finally, recommendations and best practices are presented along with a case study highlighting the importance of patient/practitioner communication when offering culturally safe palliative care. For further information regarding conversation on palliative care with Indigenous people, please see the Completing the Circle video series at https://www.youtube.com/user/EndofLifeCareProject.